Introducing Timeline: Whistle’s newest feature. 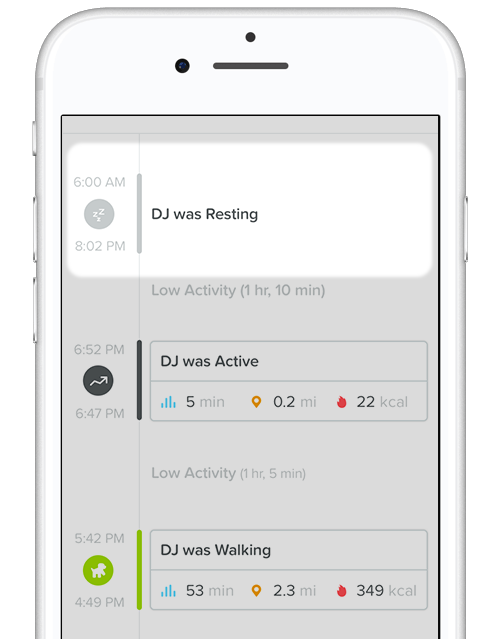 Timeline offers a deeper dive into your pet’s 24-hour day, breaking up Daily Activity into timestamped segments called “events”. 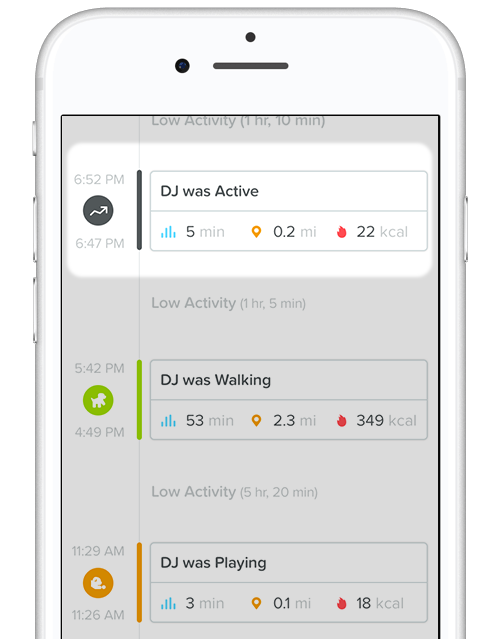 Timeline tells you when your pet is walking, playing, running, and more—even showing you exactly when they hit their Activity Goal. Timeline saves your pet’s history in your Whistle app, which means you can go back and review your pet’s activity for any day. Interested to know what your pet was doing two Sundays ago? Just scroll through the dates at the top of the Activity screen and examine the timeline for that day. When your pet moves from one activity to the next, like running to rest, Timeline creates a new Event. And each Event lists how long the activity lasted, how many kcalories your pet burned, distance traveled, as well as the time it began and ended. Any steady, low-intensity movement that lasts 5 minutes or longer, such as a stroll around the neighborhood or your pet pacing the house for 7 minutes is considered Walking. Running is a steady, mid to high-intensity movement, that lasts for 3 minutes or longer—like taking your BFF on a jog. Short bursts of high-intensity activity, that includes back-and-forth motion lets Timeline know your pet is Playing. Unlike Running, Playing involves quick changes in speed, intensity, or direction. Even though your pet is getting in lots of running during a game of fetch, the sprints and pauses tell Whistle they’re Playing. Events marked as 'Active' means your pet's movements were not long enough or intense enough for Timeline to categorize. Think a casual stroll with lots of stops or an intense chewing session. If your pet is taking it easy, making minimal movements that are casual, short, and low-intensity—like strolling from room to room, or sniffing around the house and backyard — you’ll see Low Activity on their Timeline. Resting means minimal movement for an extended period of time, but it isn’t necessarily sleeping. Your pet might be lounging in the sunshine, or watching the neighborhood from their favorite perch on the couch. Because every pet is different in their own way Timeline can be tailored, allowing Whistle to better understand your pet. Currently, the Event popup list includes: Walk, Run, Play, Swim, and Active. You’ll notice that you can change an Event to Swim. It’s not currently an Activity that Timeline can recognize on its own. But with your help, one day it will! How much activity does your dog need to stay in shape? Perception vs. Reality: Is Your Sled Dog Actually a Couch Potato?